SimplyRhino UK is organizing a group interested in meeting ito network, discuss, and explore Virtual Reality (VR) solutions for Rhino. At each meeting there will be at least one presentation from a customer with experience VR, all followed by group discussion and informal pleasantries. The first VR for Rhino User Group Meeting date is set for Tuesday, October 10, 2017, in London. We hope you can join this new group. "Grimshaw has a history of using VR in an architectural setting, including early adoption of the Oculus Rift as a fully dynamic environment, and subsequently Samsung Gear headsets for more static experiences. Over the past year, we have been increasingly looking at using VR beyond a presentation capacity and integrating the technology into the design process. 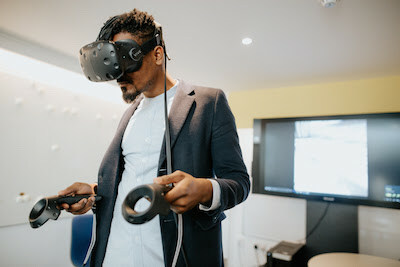 To date, this has largely been looking at using VR for design reviews through Prospect, with the hope of progressing to a modeling platform via applications such as Mindesk, and eventually developing our own tools to leverage the most from VR. The presentation will show our experiences and progress using VR and Rhino, from early exploration for presentations to a more established review-oriented workflow."